The Provost Missed His Pay-Day Party. Nobody cried. We had a great time at the protest outside Provost Michael Arthur’s office today. It was a no-show for poor old Provost, however, even though we’d brought him cake! Joining this protest against inequality at UCL were members form the UCL Justice for Cleaners Campaign and UCL UCU, who spoke about how cleaners are organising a campaign for better pay and conditions and how the top UCL fat cats are getting rich from cutting university workers’ pensions. The protest took place outside the Provost’s Office and Jeremy Bentham’s creepy cabinet. We handed out lots of flyers! 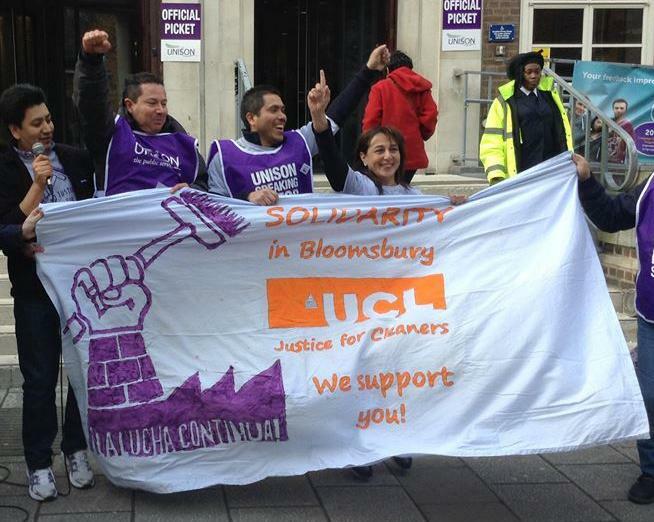 The banner of UCL UNISON, the trade union of the Justice for Cleaners Campaign. 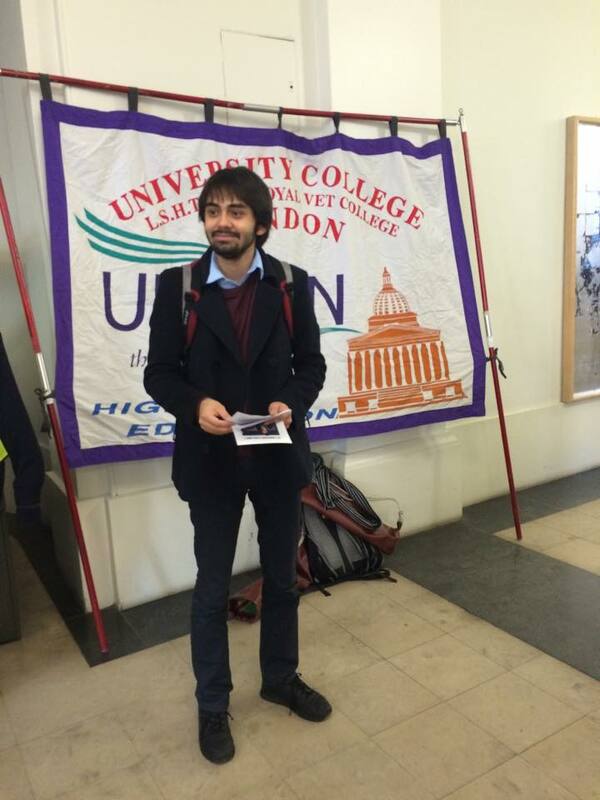 One of the speakers at the protest from UCL UCU. Cake to commemorate that Provost earns as much in 19 days as a cleaner earns in a year. After shutting down debate at the last UCLU General Assembly when his side failed to win a political argument, Gabriel Gavin wrote an article for Pi to justify himself, in which he covers up his lack of arguments by throwing playground insults at me and others. Ahead of the next session of the General Assembly I’d like to take the opportunity to respond, and present my case for why UCLU should remain a campaigning organisation that stands up for students’ needs. David outside the UCL Student Residences Office. Very soon, UCL management will once again increase the rent in their halls of residence by at least five percent. This rent hike will place yet another heavy burden upon students already hard-pressed to make ends meet. As a socialist who wants justice, equality and cooperation to replace exploitation, division and coercion, I find this disgusting and I will fight against it. Why do I, as an unpaid activist and union representative, devote my evenings, lunch breaks and weekends to organising assemblies, build protests and write to UCL managers? Because, unlike the Gabriel Gavins and the Samuel Inkersoles of the world, I’ve decided to do the work actually required to concretely improve standards and conditions for students here at UCL. Increasing rent is a political decision made by UCL bosses, who dictate how hard halls residents should be squeezed for cash. This decision will also force working class students to take on more debt and stress while in halls, if they’re lucky enough to afford university in London at all. For the past five years, UCL has consistently increased the rent far beyond the rate of inflation. The consequences of this will be felt in the pockets of students, in our mental health and among those excluded from UCL altogether simply because they weren’t born with a silver spoon in their mouths. 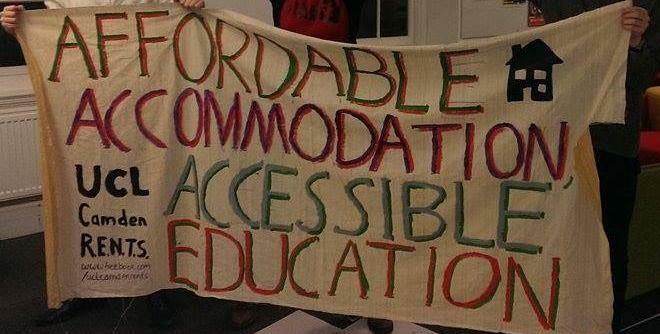 “Affordable Accommodation, Accessible Education” – A banner from the UCL Camden RENTS Campaign. 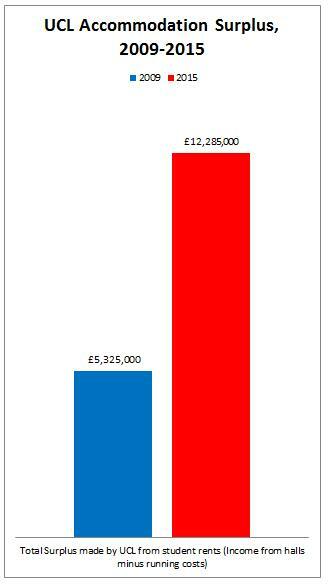 Fortunately, we have the means to help us change this – a political, representative and campaigning students’ union. Through collective action we can challenge UCL management, and UCLU is the best tool we students possess to channel our demands and focus our collective bargaining power on bring down the rent. I would be the first person to admit that UCLU has its flaws (don’t we all? ), but I also stress that it’s activists like me who’re the ones taking actual steps to make it better and more representative. 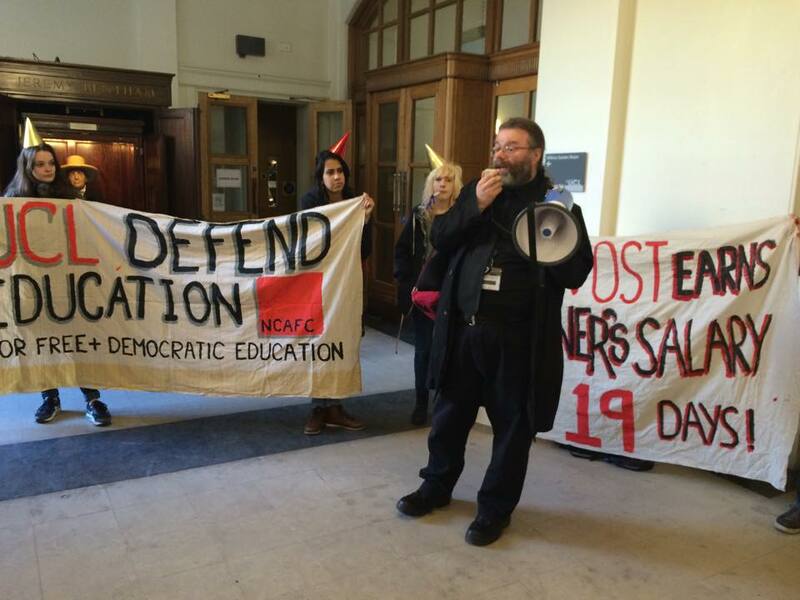 There is a tendency among certain careerists, and right-wing demagogues and sabbatical officers to criticise the work that my friends, colleagues and comrades on the left are doing to improve the conditions of students at UCL. These would-be union-wreckers, clearly, either do not understand what a union is for, or are happy to see the counted attempts by the university bosses’ to exploit and oppress us but raising rent or ignoring campus racism and sexism. The case for why this position is wrong has been made explained eloquently elsewhere. Therefore, I’m not surprised that there is also a tendency among these critics to find themselves incapable of intellectually justify their arguments. Much like a children deprived of attention by an adult, these right-wingers reverted to ignoring rational arguments, shouting loudly and spreading lies and insults. Suffice to say, none of their time has been spent on getting UCL to reduce the rent. To the contrary, efforts made by Gavin and Inkersole to axe the Education and Campaigns Officer, Women’s Officer and BME Students’ Officer would – if successful – have severely decimated the ability of UCLU to stand up for our needs. 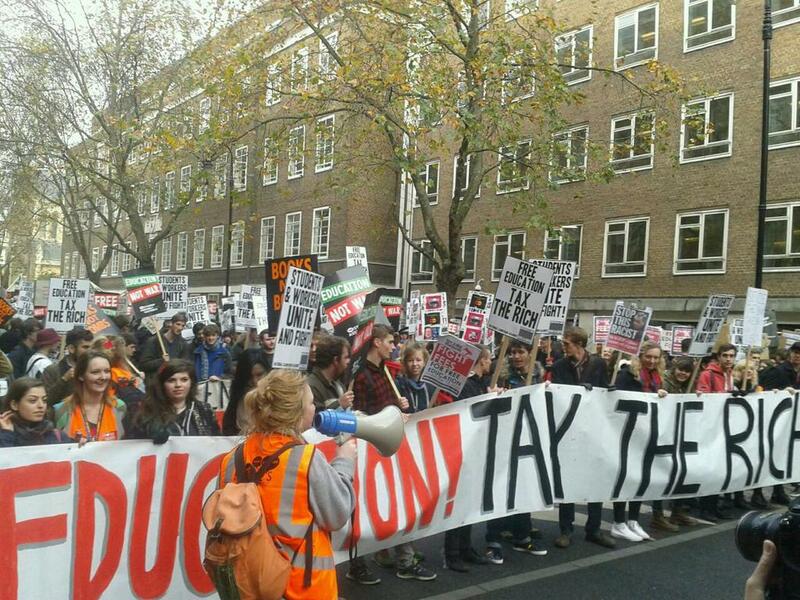 “Free Education – Tax the Rich”, the slogan at the demonstration for free education 19 November 2014. My actions, as a socialist activist, will, in the meantime, have an actual impact on the lives and conditions of current and future UCL students. At the same time as right-wing self-publicists portray themselves as some sort of ‘voice of the masses’, while doing nothing but attack our efforts to organise ourselves as a student body, I and other activists have been organising a focused and assertive campaign to challenge the university bosses’ rent hikes. 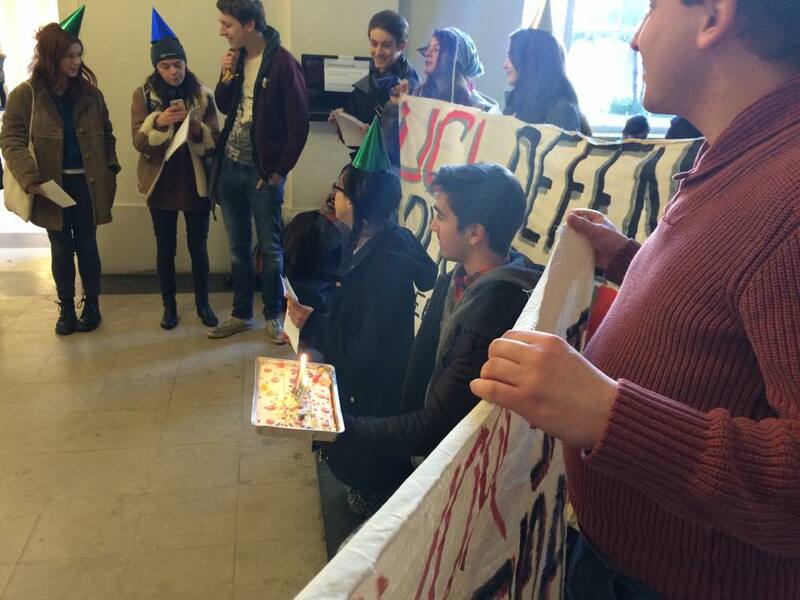 I’ve pressed UCL to financially compensate students who experienced hot water cut in halls. I’ve forced UCL to acknowledge the important of disability access in student accommodation. And, while right-wingers have happily accepted £9,000 tuitions fees, I’ve helped build a grassroots national campaign for free education. I’ve done this by engaging with students, by talking to literally hundreds of people and by representing their views and opinions. 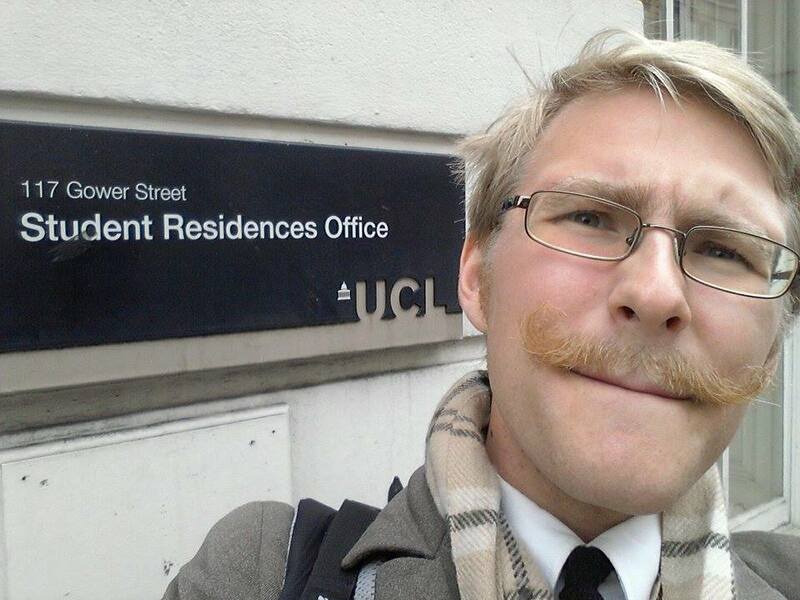 This term, I will step up the campaign against rent exploitation until UCL students have won a genuine improvement. None of these efforts to improve our material conditions would be possible without a UCLU that can be relied upon to take action for its members. This is precisely why we need a political, campaigning students’ union that puts the material needs of its members ahead of the careers and egos the right-wingers who want to cut it. This is why we need more liberation officers, not fewer. As UCL becomes increasingly like an authoritarian government this necessity becomes ever more pressing. As UCL bulldozes our student theatre, wreaks havoc for sports clubs by timetabling lectures on Wednesday afternoons and charges us rent far above our maintenance loans, the stakes couldn’t be higher. If we don’t take a stand against the bosses they will make UCL exclusive to the children of the wealthy and irreversibly damage student civil society. UCLU and I will continue to fight the rent increases and stand on the side of everybody who wants university to be available for everybody regardless of their background. I hope you will join me in this. – Now, I’m off to write to UCL Accommodation! 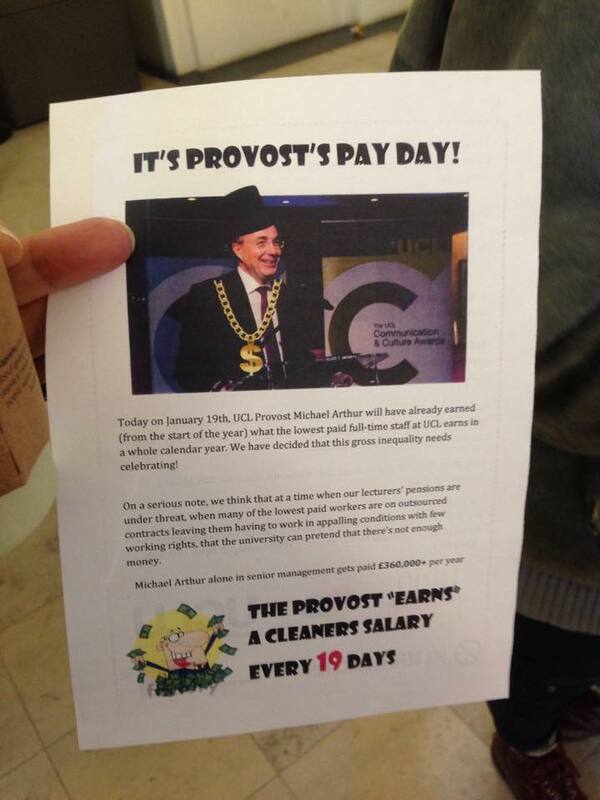 Tomorrow UCL Provost Michael Arthur will have earned as much in 2015 as an out-sourced cleaner here earns in an entire year, about £16,000. In order to commemorate this momentous achievement we’re organising a party for him and Everybody is invited! Find all the details here. A banner from the UCL Justice for Cleaners Campaign outside SOAS, where cleaners organised themselves, demanded and won vastly improved wages and conditions. April 2014. There will be party hats and cake for those attend the party! We hope that Mr Arthur will join us so that we can ask him how he sleeps at night and why he thinks the migrant workers who clean his office should earn little more then a living wage and not enjoy the same privileges as himself the other male, white fat cat bosses. Spend the money on cleaners’ wages, no the bosses! “Michael Arthur [or Provost, Provost] we’ve got beef! Tomorrow’s protest will not only be about the unjust pay gaps between cleaners and the 1% of UCL, but also to highlight the gender and racial pay gaps at our university and to demand that workers are given a larger say over how wages are distributed. Read our demands here. See you tomorrow, Michael Arthur!! 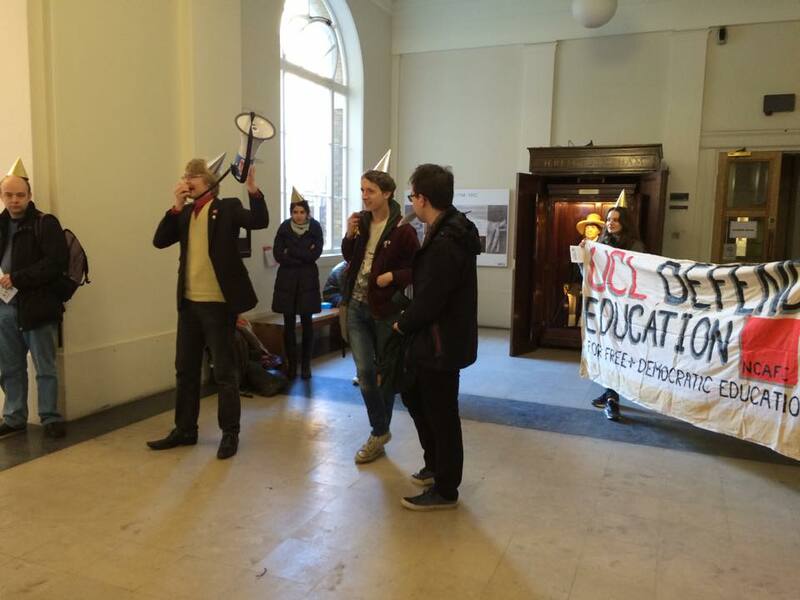 Provost’s Pay-Day – Protesting Inequality at UCL! 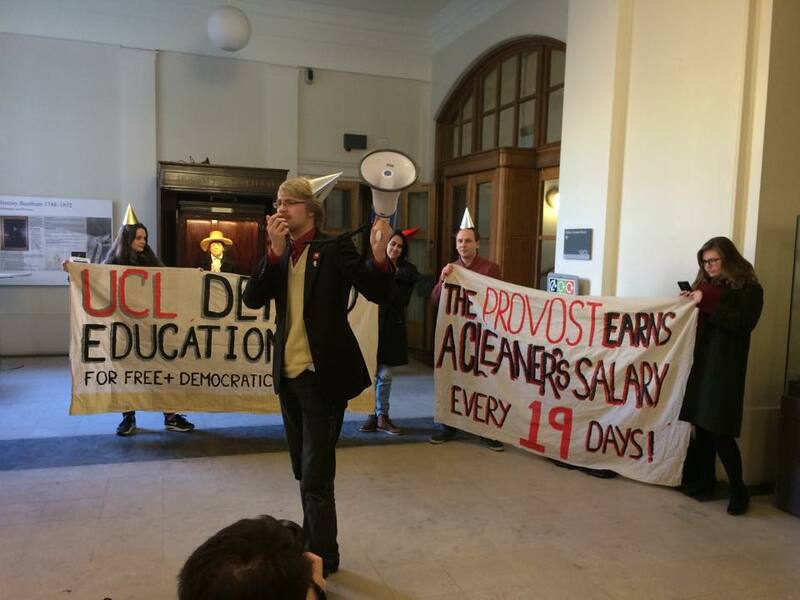 On Monday January 19th, UCL Provost Michael Arthur will have earned in 19 day what the lowest paid full-time workers at UCL – outsourced cleaners – earn in a year. Arthur earns almost 20 times as much in a year as the people who clean his office and private kitchen. We are going to protest this grotesque inequality by holding “a party” (see link) outside the Provost’s office in the Main Wilkins building at UCL at 1pm on Monday. Everybody is invited! Fat cat Provost Michael Arthur is one of the wealthiest men on campus. He earns 20 times as much as a cleaner and has his home paid for by the uni …wonder who works the hardest? Beyond the Provost, there are 113 members of UCL staff who every year are paid more than 10 times the annual wages of a cleaner. All together they earn a combined £21.5m. 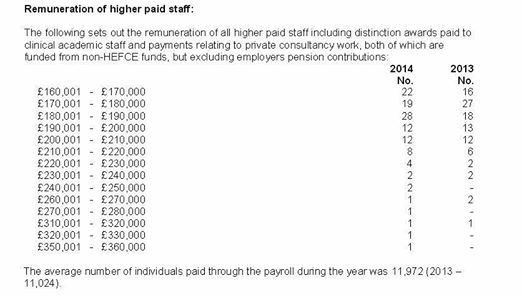 The salaries of those at UCL who are paid more then 10 times as much as an out-sourced cleaner. 114 out of 11,000 employees, these are literally the people who constitute “the 1%” of UCL! 3. Democratic structures which put workers, students and local communities in control of our universities, colleges and schools, including on issues such as pay. Come along and show the Provost that we won’t stand for this absurd inequality of pay. Our staff make our education possible, while management pay themselves absurdly high figures to do nothing but wreck it. Pay them decent wages with decent conditions! We don’t have to settle for these extortionate rents and terrible living conditions. At UCL halls in Camden, residents with elected reps are organising together and putting pressure on the managers to fulfil their demands. Get in touch with us to join that campaign or for help starting one in another hall. collectively agree not to pay rent until an acceptable deal is reached. At Sussex University throughout 70s and 80s student rent strikes reduced rent rises and stopped low quality halls being built. 4 years ago, an Oxford college struck over fire safety. 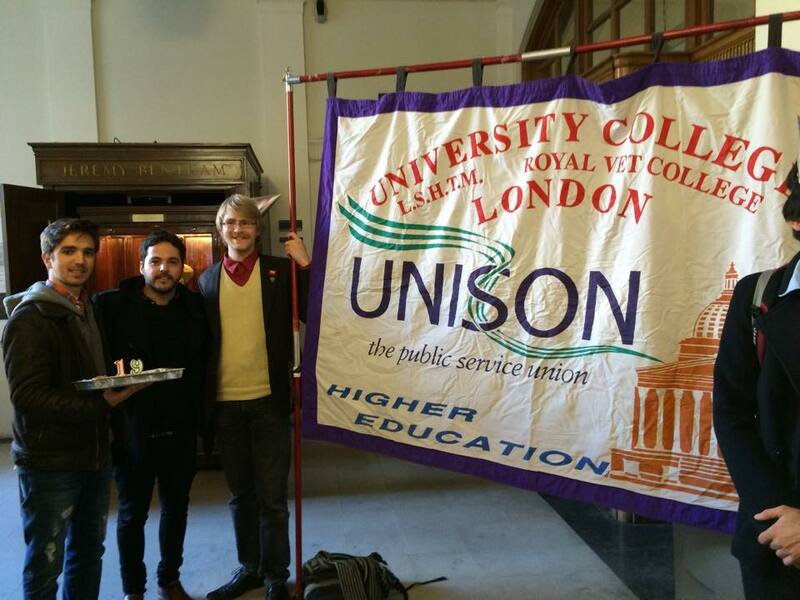 We hope UCL managers voluntarily improve standards and cut rents. But if we have to fight, we will! An item on one of the rent strikes at Sussex Uni, from the uni newspaper ‘The Bulletin’ January 1973.